Scott Conant was born on the 19th February 1971, in Waterbury, Connecticut USA, of American and Italian ancestry. He is a chef, probably best known for his appearances in a number of television cooking shows, including “Martha Stewart Living”, “Top Chef”, “Anthony Bourdain: No Reservations”, etc. He is also known for publishing a number of best-selling cookbooks and for owning several restaurants. So, have you ever wondered how rich Scott Conant is? It has been estimated by authoritative sources that the overall size of Scott’s net worth is over $5 million, as of mid-2016, accumulated through his successful career as a chef and owner of several restaurants. Another source is coming from selling his cookbooks. Scott Conant began cooking when he was a child, attending cooking classes at the local community college. He studied at W.F. Kaynor Technical High School, after which he enrolled at the Culinary Institute of America. 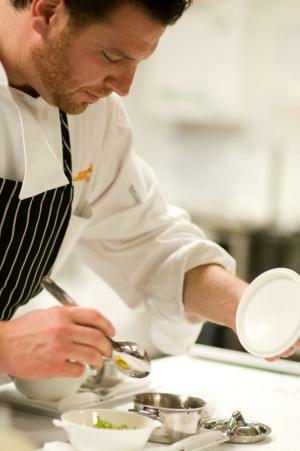 Scott’s career began while he was still at college, serving as an intern at the San Domenico restaurant in New York. Following the end of his internship, and his graduation from college, Scott moved to Munich, working at the Hotel Bayerischer Hof and learning about pastry. After a year in Germany, he returned to the USA and the restaurant San Domenico, to work as a sous chef, and his job was also to help the restaurant gain a three star rating from the New York Times magazine. Little by little, Scott`s name became one of the best known in the restaurant business, and in 1995 he was appointed as chef de cuisine of the Il Toscanaccio restaurant, located in the Upper-East Side, and the following year, he re-opened two restaurants Barolo in SoHo and Chianti on the Upper East Side. After that, Scott was appointed as the executive chef of the City Eatery, situated on the Bowery in New York City. Ever since then his career has gone only upwards, and so has his net worth. In 2005 he opened two new restaurants – L’Impero in Tudor City, and Alto in midtown Manhattan, which only added further to his net worth. In 2008 he opened another new restaurant, Scarpetta, located in Chelsea, Manhattan, increasing his net worth even more, especially as the restaurant received a three-star review from The New York Times. He then opened several more new restaurants in 2010, including in Las Vegas and Beverly Hills. Thanks to his skills, Scott has made numerous television appearances in such shows as “The Best Thing I Ever Made” (2011-2012), “Food Network Star” (2011-2012), “Rachael Ray” (2011-2015), “Beat Bobby Flay” (2014-2016), and “Chopped” (2009-2016), among others, all of which have helped add to his net worth. Scott has also written and released several cookbooks too, including “Scott Conant’s New Italian Cooking (2005), and “The Scarpetta Cookbook (2013)”, which are also contributing o the overall size of his net worth. He has received several prestigious awards, including the “Best New Chef” from Food & Wine Magazine in 2004, among many others. Speaking about his personal life, Scott Conant has been married to Meltem since 2007; the couple has two daughters. Their current residence is in New York City.